Can you imagine having a 14 foot shark trailing you? And this is not your average shark, but a Great White. A shark of folklore, notorious for sinking boats and devouring beach-goers thanks to Steven Spielberg’s famous movie Jaws. 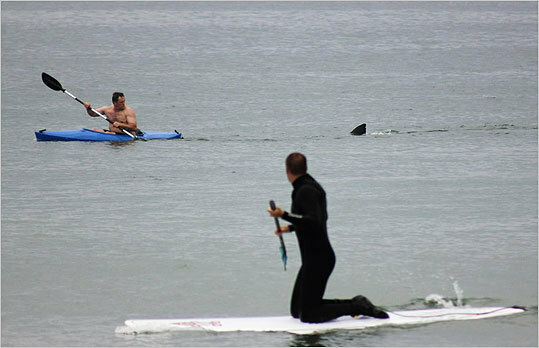 Fortunately, this kayaker made it to shore without a scratch, thanks to the quick thinking of a fellow paddle-boarder who made him aware of the lurking predator. The shark was spotted a little more than 150 feet from shore in only 8 feet of water, a little bit closer to swimmers than normal. In an interview with the Cape Cod Times, the kayaker, Walter Szulc Jr., stated that he “looked down and saw the body and realized that part of the shark was underneath [him], and just proceeded to paddle.” That’s a very calm response after encountering an animal that can swallow you whole, if you ask me. Nauset Beach was closed to swimming following the shark-sighting, but reopened a few hours later after the water was deemed safe. I don’t know about you, but I’d constantly be peeking over my shoulder after an encounter like that! Photo and Quote taken from the Cape Cod Times, article seen here!